In a way, Seattle has a permanent piece of the paleo-future. 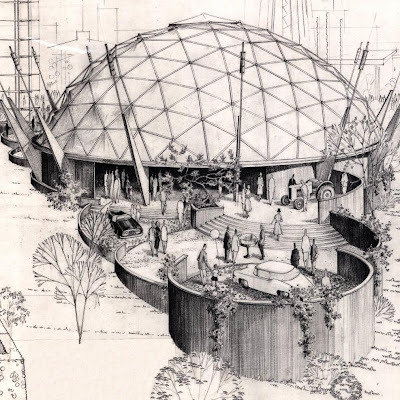 The always amazing blog BibliOdyssey has a great post titled Century 21 Exposition. 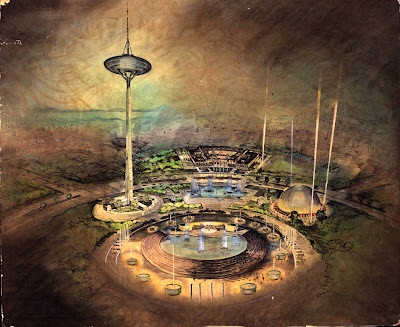 It features proposed designs for the Space Needle and the fairgrounds for the 1962 Seattle World's Fair (also known as the Century 21 Exposition). For an amusing film following teenagers through the expo be sure to check out Century 21 Calling. Was the Space Needle ever orange and mustard colored? 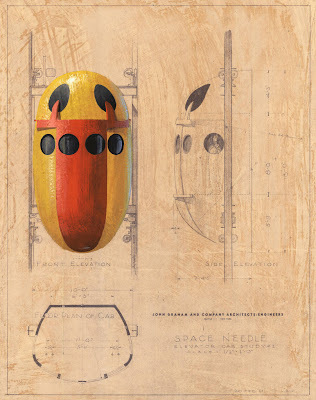 Wikipedia says: "With fresh paint of such names as Orbital Olive for the body, Astronaut White for the legs, Re-entry Red for the saucer, and Galaxy Gold for the roof, the Space Needle was finished in less than one year." I was just listening to Mike Oldfield's Songs of Distant Earth -- beautiful musical adaptation of an Arthur Clarke novelette -- and was struck by how paleofuturistic the synthesized voices were. They reflected the actual imperfections in the reproduction of Apollo astronauts reading from Genesis. Don't remember which mission that was. 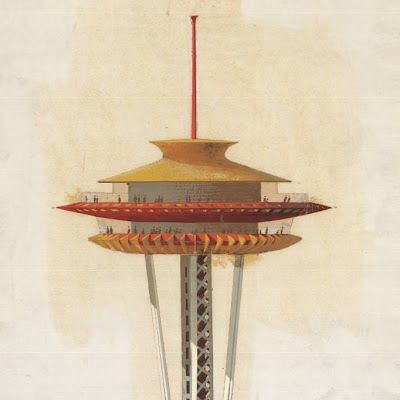 I dunno about orange and mustard colored, but for a long time the Space Needle was orange (the saucer) and white (the supporting structure). I think those were its original colors. The same site has some interesting if shoddily-constructed Minoru Yamasaki original architecture (he was a native, but left and never came back). It was never intended for long-term use. The fountain on the grounds was replaced but the new one is interesting when they run it. Like the old one it plays music but unlike the old one it is now random "world music" as classical was deemed Eurocentric and politically-incorrect. The reason "the future" never happened was because all our real capital has been destroyed in the pursuit of the permanent warfare-welfare state. If you want to see the future move to Asia. Seattle is now a hopelessly corrupt 3rd world backwater run by a local crime syndicate. Boeing pulled up stakes and the software industry is fleeing to India. Atash, I must ask, are you high? A local crime syndicate? Who is that? The only syndicate type activity is the Russian mob and the Chinese gangs and the former is pretty recent. The latter focuses on the smack trade. The software is leaving? Huh, I guess Microsoft will quit buying up property and expanding and other software companies will quit being created real soon now. I live in Oakland working at a Bay Area startup these days but I was born and bred in Seattle. I only left last year and, frankly, if I had a free choice between one or the other on quality of life, Seattle beats the Bay Area. I never saw crack whores and the complete ignoring of whole classes of society until I moved here to the Bay Area. Jeez, name me a city that *isn't* corrupt! We just made the reverse move - 18 years in SF, 1 year and counting in Seattle area. California finally wore out its welcome. It's interesting to gain some perspective an how insane things are there. Thank goodness we got out right before the big real estate slide. It's so hideously over-priced and over-rated in almost every respect. Seattle has SF sooo spanked when it comes to quality of life. Sure the weather in SF is nicer, but we can live on one income here, send our kids to clean and safe modern public schools, and I no longer need to expend any energy trying to convince myself of California's superiority. Software companies bailing out of Washington? Are you on crack? MS is building a new facility that will add 17,000 employees. Maybe with all those new people they will finally produce a decent piece of software. It may not be the City of the Future, but it's great as the City of the Present.